Tin cans are really useful items -- you can turn them into vases, wine racks, luminaries and even shelves. But, before we get carried away, we want to show you this simple Craft Of The Day. With a little paint, you can turn a can into a pretty desk accessory. Keep reading for the how-to. 1. Thoroughly wash the tin cans. 2. In an open area, spray paint the cans and let them dry. 4. 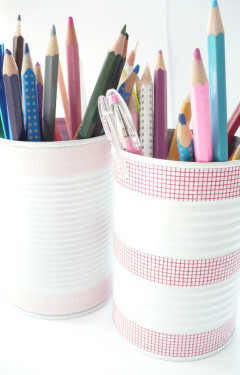 Place the tin can on your desk as a pencil holder or use it as a vase. Enjoy! Be sure to check out the other great crafts in our Craft Of The Day slideshow below.